Contents: 5 ּBooks of Moses, Haftaros (Hebrew – English). – Preface. Foreword. Introduction to the Public Torah Reading. Insights into the Name of Parsha. Blessings on Reading the Torah. Blessings on Reading the Haftarah. – Appendixes A to C. Bibliography. Comments: Hardbound luxurious butter-soft brown embossed cover; large octavo, sewn binding, LVIII, 1562 & (10) pp. Masora, Targum Onkelos, Rashi and Commentary on right, translation and diverse more commentaries mostly on left side of double page. Tables & Diagrams. Translation set in paragraph form. Haftaroth (Prophet readings, Hebrew / English) from p. 1369. Appendixes (from p. 1535): Summary Charts, List of Mitzvos, The Location of Kadaish–Barne´a. Bibliography. 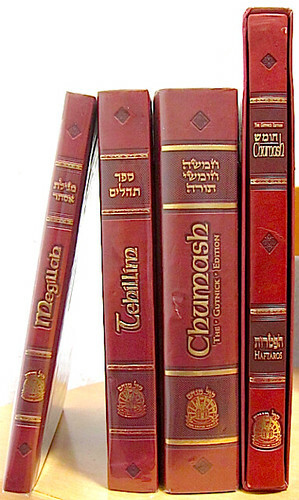 The rich commentary arrangements comprise, besides Rashi, of “Toras Menachem, Rashi Sichos“, Chasidic teachings “Sparks of Chasidus“, practical directives “The Last Word“, Explanations of the Name of each Parsha. » The translation itself has been written in a contemporary style, attempting to make the words of Torah relevant to the modern reader. Nevertheless, every attempt has been made to remain loyal to scripture. Unlike Kaplan [The Living Torah, 1981], we have not omitted awkward words or abandoned translation for idiom. However, we have also rejected the opposite extreme exemplified by Scherman [Chumash–Stone Edition 1993], where the precise sequence of words within each verse is preserved and loyalty to original Hebrew grammar has led to abnormal Englsih usage. In addition, the text has been punctuated and paragraphed at the discretion of the translator, following the precedent of Kaplan and Scherman. 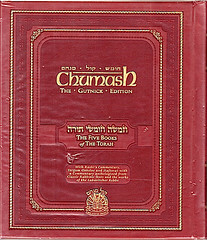 Headings have been inserted within the English translation.« Other translations, which Miller studied for this Chumash are, “The Bible Unauthorized“, by A. H. Moose, “The Linear Chumash“ by P. Goldberg, and “The Margolin Torah“ by B. S. Moore. The "Introduction" (12 pp) unfolds and discusses 1) The Public Torah Reading. 2) Reenacting the Sinaitic Event. 3) The Aliyah–Being Called to the Torah. 4) Maftir. 5) Hagbah–Raising the Torah Scroll. 6) The Haftarah. Contents: Haftoroth (Prophet readings). – Contents. Preface. Introduction to the Public Torah and Haftarah Reading. Cantillation marks. – Bibliography. Comments: Hardcover, luxurious butter-soft brown embossed cover, boxed; sewn binding; quarto, XXVI, 184 & (5) pp. 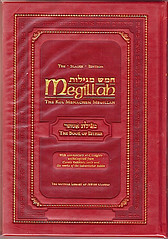 plus 2 extra enclosed pages with “Blessings on the Haftarah“. – Masorah and translation on each page, copious footnotes. 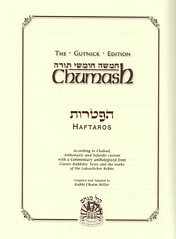 Compared to the Haftaroth in the Chumash, numerous enhancements have been made in this edition. Contents: 5 Books of Tehillim. – Dedications. Foreword. Prayer before reading Tehillim. – Prayers after saying Tehillim & other occasions. Comments: Hardcover, luxurious butter-soft brown embossed cover; sewn binding; large octavo, XXXII, (5) & 444 pp. – Masorah and translation on each page, copious footnotes. 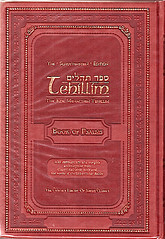 Beyond what a mere book description is able to say, the image shown reveals the perfect design of this Psalms Book with decorative elements, the highly readable letter work of the Masoretic text, the artwork of the chapter numbering and the carefully selected text / commentary arrangements. This demonstrates how a Bible Book should look like, it´s pure pleasure to read, learn and pray with. 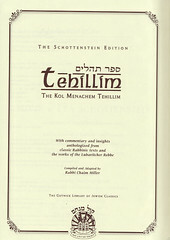 Though written for and aimed at a specific group of Jewish readers, this “Sefer Tehillim“ is a Book to feast your eyes on. 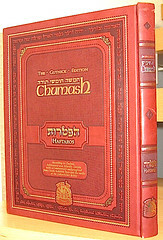 Comments: Hardcover, luxurious butter-soft brown embossed cover; sewn binding; large octavo, XXVIII, 104 &  pp; Masorah on right, translation on left side of double page; commentary & insights beneath texts. Book decoration as in the Book of Psalms (above). 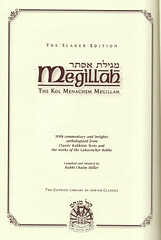 Rabbi Chaim Miller introduces this Scroll on 15 pages, dated 5th Teves 5771 [Dec 12, 2010], and paragraphes it into „Synopsis“, “Kol Menachem Megillas Esther“, and “Acknowlegements“. Other than in the Psalms–Book, he does not give information about the English translation. 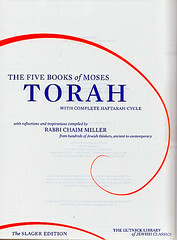 Title: Torah • The Five Books of Moses • With Complete Haftarah Cycle • with reflections and inspirations compiled by Rabbi Chaim Miller / from hundreds of Jewish thinkers, ancient to contemporary • The Slager Edition / The Gutnick Library of Jewish Classics. 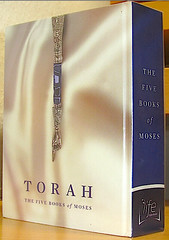 Contents: Torah – The Five Books of Moses, Haftaroth. – Table of Contents. Index of special Torah readings. Introduction. Transliterations Rules. Blessing on Reading Torah. – References. Bibliography. Dedications. Comments: Hardcover, octavo, sewn binding; XXIII, 1500 &  pp. 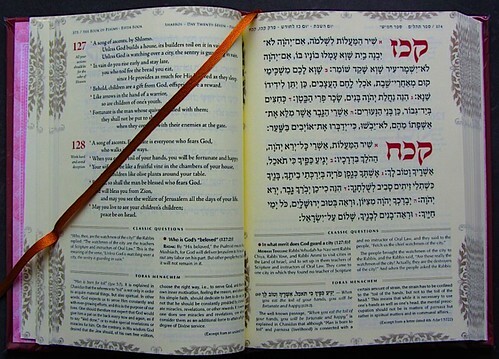 Scripture texts per page: Masorah and translation; paragraphed into parashat. Commentary in boxes. Book and Parasha introductions. 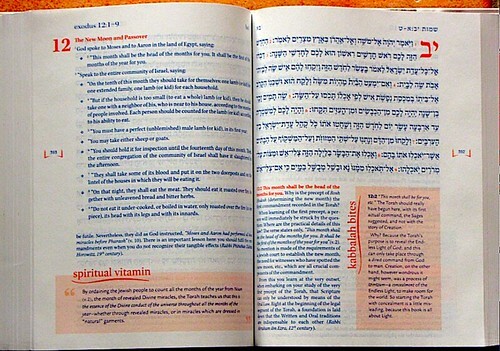 Highlighted features which are presented inside the commentary are: ´Kabbalah Bites`, ´Spiritual Vitamins` and ´Food for Thought`. 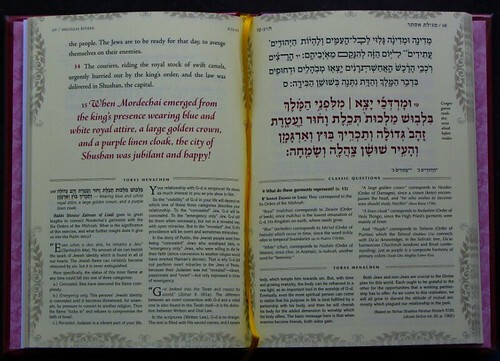 The Scripture texts are printed in blue, Headings and frames in red. Each Parasha is described as to (the meaning of its) name, meaning, Parashiyyot, no. of verses, words, letters, the date, location, key people, Masoretic features, mitzvot and note. The main character of each actor is profiled. 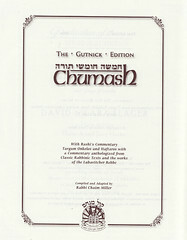 The translations follow the ones of the Gutnick Torah Ed. and the Haftaros volume (see above). Contrary to what Miller wrote in his introduction, the in–text–interpretations within the Haftoroth, which are bracketed in both the Chumash and Haftaros Editions are not bracketed here. This makes it quite difficult (if not impossible to the non–Hebrew reader) to distinguish the pure wording rendered from the Hebrew and the inherent interpretation given by the author.